Please email me directly [icon above] for “autographed” International shipping or multiple orders of our Book. Just a few miles from us, up the road. 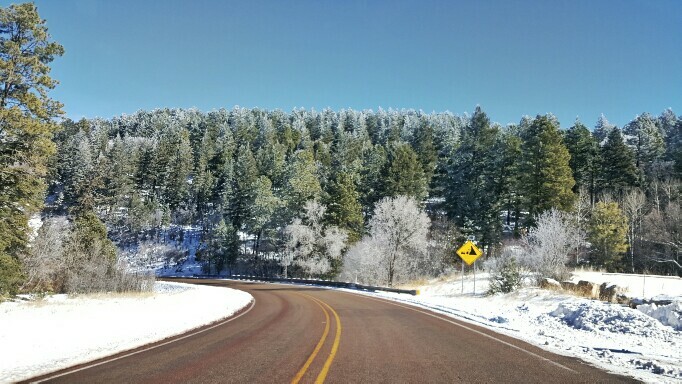 Lincoln National Forest. Brrrr…. and it is really not that cold! A strange humid and windy day has shown up which gets into my bones and makes me shiver. I should say “makes us” shiver as also Spirit does. I feel as him and I are the same age and going through the same motions. He seems to be accepting his present times as well as I do. I just wish I could maybe sleep as much as he does! Sleeping is not coming as easy as in years past but then again it might be a good thing allowing me to spend more awake time enjoying these days. Why force the issue? Especially when the word “softer” [physically!] appears as a banner lighting up throughout the day. I am learning to pace myself, learning to justify “why do it today if it can wait until tomorrow?” even if too aware of the fact that tomorrow might never come. If it does not, I will never know… right? All is actually easier. I noticed this at the store the other day when I was looking for a particular item [which I forgot what] and the store clerk finally after much search told me they were out and apologized profusely. She was a bit surprised that I smiled and just said “that is fine, it is not the end of the world for sure”. Priorities keep changing. Health and making it through the day, as pleasantly as possible I might add, well, that is the priority. Getting adventurous with my home made Sushi! This morning is a 9am Dr’s appointment. A hip Dr. The left one is definitely letting me know of its demise but mentally and physically I am not ready to once again confront a surgery, a hospital or even a single shot. These past two years have been too much and I want to wait at least another 9 months. I am hoping he can alleviate the pain with some magical wand! Anything at this point. Something that will activate the choke in the mornings when this engine is stalling. I have “health issues” conversations with my Friends. I keep repeating myself saying “if you would have told me just even two years ago we would exchange health issues I would have told you that you are insane”. It does help however. I find myself searching for better nutrition, exercises, anything that I never thought about in my earlier years when my body was an invincible rocket through Life. I have to see the humor in all of this. I would not survive otherwise. It is what it is… Always. So talking about “soft and softer”, all has to do with the weather I am finding out. I don’t want to camp in the cold anymore. I don’t want to camp in rain storms, bad weather as beautiful as bad weather can be. I think and know our camping opportunities will be dictated with good weather windows. One more aspect of acceptance… Is it the central heating here which has “us” spoiled? The day has arrived for Spirit needing a ramp. He is just not making it and I cannot lift 60 lbs. I cannot drag him for sure and pushing him just does not work. A ramp! Who would have known? This is a dog that could jump over my shoulder just not too long ago. At least there is a solution to get him out of this house at times. And let’s not say “poor guy”. It is the normal span of Life. We have a home! He is comfortable. It is more than what we ever had since I rescued him 12 years ago. We have great memories in our minds and in photos. I am finding memories to be consolable while sitting, at times closing my eyes, and reliving the past. It is as a long, very long movie…. When I don’t feel like cooking, basic menu, very doable. What I am however enjoying the most is my mind. Without putting myself in any way on a pedestal, I am finding myself wiser, more logical, more understanding of others while my gray areas widen. I am paying more attention to my priorities and that fact alone has helped tremendously. What is important and what is not while realizing that so much has no importance. As weekly [only!] I open my Flipboard application and read [only again!] the headlines I feel as the world has gone mad a bit and I refuse to join the bandwagon. I mean this seriously. Those headlines are depressing while including name calling, harassment, you name it. What is going on? The truck/camper and a UHaul enclosed trailer are here parked outside. We are going back to The Oasis to bring back whatever I have left behind. Obviously must not be too important as I have not missed a thing. “Stuff!”. Lucky here with two storage sheds which were awaiting. Good “Karma” again. The new owners are the nicest people. As surgery was coming up they allowed me to leave what I could not take behind and they will be there on Sunday to meet us. They are in Love with The Oasis and still calling it as such which makes me really happy. The Doctor’s visit is behind me. A good man who honestly said that even my right replaced hip will never be the same as in years past. I knew that! I did get a shot [without looking at it!] which should take the pain of the left one away as even if I wanted a replacement, because of my heart surgeries they have to wait one full year. It makes sense. Hopefully it will start helping these coming days. Busy lunch counter. 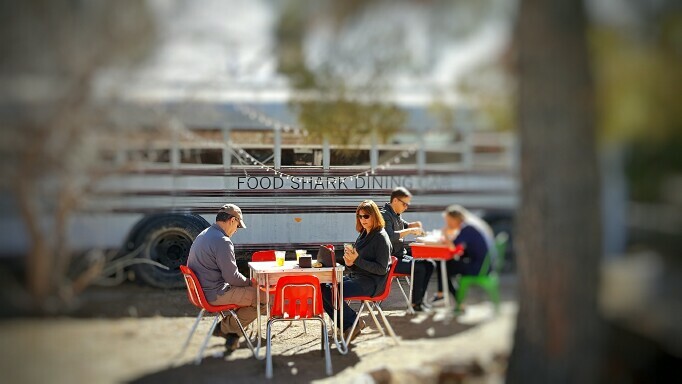 The “Food Shark” in Marfa, Texas. Almost as a dream we are now rolling on Highway 118 in Big Bend, Texas, a road taken hundreds of times and yet, it does not feel the same today. I do see the beauty surrounding us, I smell the dirt in the air mixed in with a clear blue sky. What is now missing is the attachment towards the land. I feel a bit as a foreigner here. I always felt in previous years so lucky to have a base camp I could call mine, ours. A space where freedom always welcomed us. I realize I could not be attached to “off the grid” anymore. With the years passing this word “comfort” has made way into our Life. Another acceptance and for that matter why refuse comfort? We had our time here. The comfort in Alamogordo has taken over and strangely enough while being here I miss being there a bit… Seriously! The food store is not 60 miles away anymore, the hospital and Drs are also not 220 miles away. Spirit himself needs more care these days while I have taken him to the Vet a couple times, the second time lucky to have had time to see his Vet from Alpine. Good old fashioned one who also takes care of horses and cows. He has lost 10lbs lately and a blood analysis is showing malfunctions of his liver. He is too old to be hospitalized to rejuvenate his liver with oxygen and intravenous feeding, eventually maybe needing surgery. I am just making sure he has a Happy life right now and no pain while I cannot even contemplate the eventual outcome. Connected, yet, so disconnected… Sad! 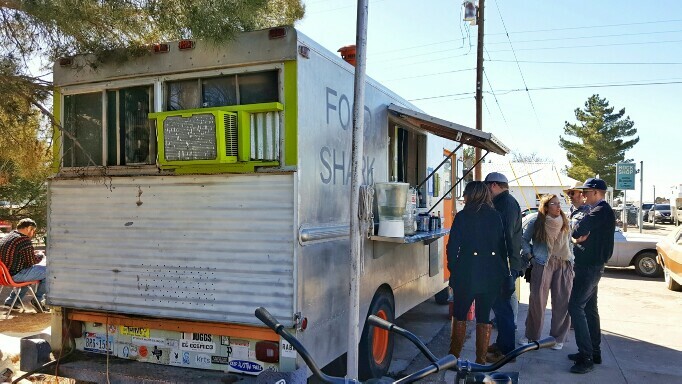 This entry was posted on Thursday, January 18th, 2018 at 6:58 am	and is filed under Alamogordo, BMW, Camping, dogs, New Mexico, travel, spirituality, pit bull, sidecar, motorcycle, cooking, photography, riding, homeless. You can follow any responses to this entry through the RSS 2.0 feed. You can leave a response, or trackback from your own site. 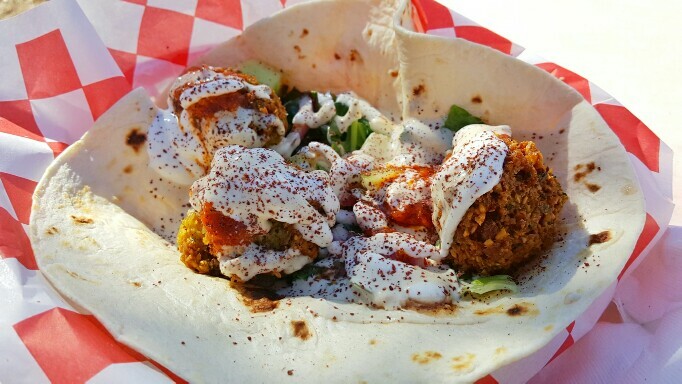 As always, we enjoyed time spent with you. I’m glad you let us go to the Oasis with you. It was bittersweet for me. I loved being able to walk with Spirit around the property. Even with his eyesight dimming, it was neat how he wound his way though the cacti and cresote without stepping wrong. He definitely remembered the layout of the land! The Oasis will always be important to you even though it is no longer home. It was a place of refuge, of healing and such a beautiful place to just “be”. We are both so happy that you have found peace and comfort. I know it was an adjustment in be coming a 4 walls kind of guy! Hugs and prayers for you both as the days continue to go by. I’m just a phone call away if you need a shoulder. Ara, I am now 71.5 and lots of what you are noticing is happening to me also. I used to love being camped way out in nowhere. Now i prefer closer to amenities like grocery stores and doctors. The little gimp in my walk is now a real hampering weakness. BUT I am working hard at adapting to what I can reasonably do and adjusting priorities to fit my current actual abilities better. I wish you good fortune with your future. Well said! A good balance for now? Hi Ara and Spirit. Something that can help with Spirit’s slowing down it a harness that helps with lifting. We used a Help them Up one that we got from our vet. http://helpemup.com/ One for our weimaraners became crippled in his back and his rear legs did not work correctly. It has been years since I have contacted you. I am gratified to learn that you and Spirit are still on the road. My wife and I are planning a trip to Big Bend and I hope you two will be there when we arrive. It would help if you would email me the park where you stay I would be be so happy to finally meet you and Spirit. We have one pit bull left but I don’t know if at 10 years old he can travel with us. Thanks for writing… Of course you do not have to read this personal Journal of ours but much has changed. We never stayed at a Park by the way. 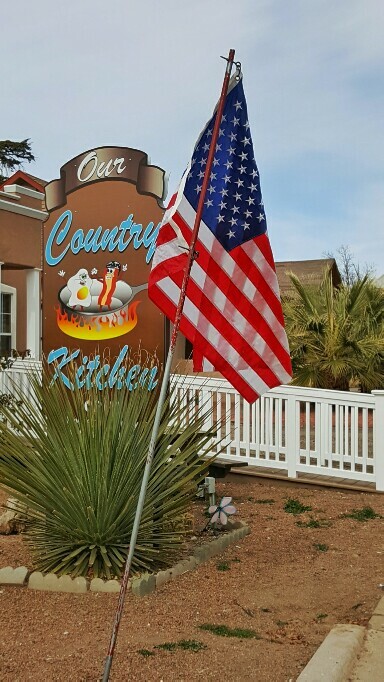 The Oasis has been sold and we now have a little home in Alamogordo New Mexico. So if ever around let us know… Have a great day.